You may create three different assessment types. There is basically no major difference between the Test and Assignment “type” of assessment outside of the semantic meaning placed on the terms. Likewise, the terms quiz, test, and exam fall under the “Test” category. The difference between them is semantic and often reflects the weight or grade value each is worth (i.e. quizzes are often worth fewer points than exams), and the stress they cause on students (i.e. exams tend to cover more material and are high-stakes). AT&S does take into consideration the type of assessment that you administer and will customize the system messages to have the appropriate wording. Likewise, if an assessment has only one question, there won’t be next and prev or a table of content. And, in assignments, there is no option for ‘strict’ order, since it’s not an exam where order is essential. Further, if an assessment’s type is set to “assignment,” the default review settings for new assignments are set to ‘manual’ and ‘upon submission’. 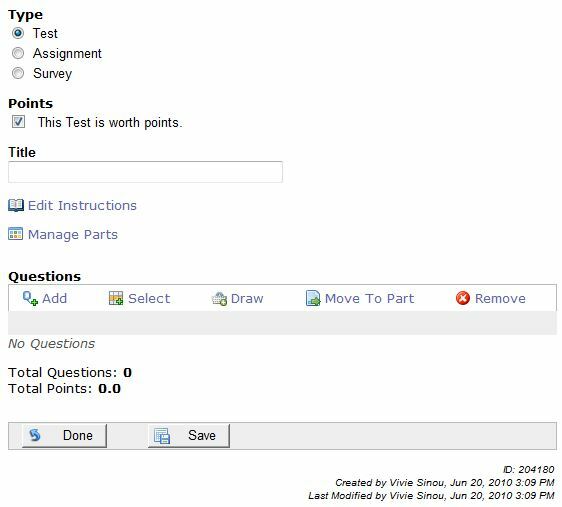 This enables students to get back into an assignment in Review to see its instructions and what they submitted (inline or attachments). They won’t see grader comments or scores until their assignment submission and scores are released, however. They will see a note that the assignment is not yet graded. A survey has unique characteristics (i.e. anonymity) and will be discussed in detail later. Each assessment type is distinguished by a unique icon in AT&S, to help instructors and students differentiate the assessment types. To get started, click on the Assessments link at the menu bar. If you have not created any assessments before, the list is going to be empty, so just click on the Add link at the action menu. The Edit Assessment page appears. You can now see what assessment types are supported.